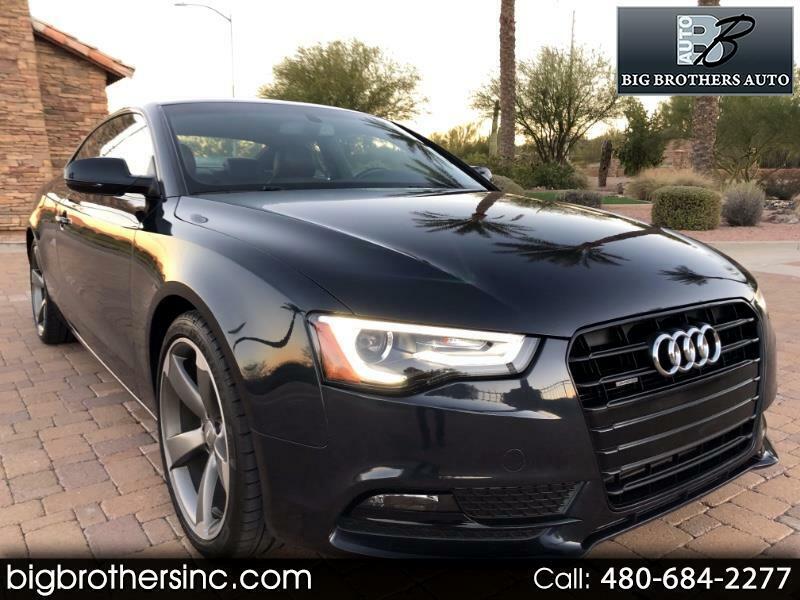 2014 Audi A5 Quattro 2.0L Premium Plus Edition with only 41k miles. If your looking for a beautiful sport coupe for an amazing price, then take a look at our newest edition. This is an AWD premium edition Audi A5 Quattro in an incredible midnight blue color. Some of the convenient options included are: 8 speed automatic Tiptronic transmission, 2.0 turbo engine, LED/Xenon headlights, MMI Navigation, 19" Premium Alloy wheels, Bang & Olufsen Sound system w/HD radio and DVD, Reverse sensors, Rear View camera, Large power sunroof, power seats with memory on driver side, heated seats, fog lights, cup holders, keyless entry with push button start and much more! This vehicle does come with a branded title due to an insurance claim. We have conducted a multipoint inspection of this vehicle and found no issues with it. We have financing and extended warranties available for all of our vehicles. If you would like more information or would like to see and test drive this car, please contact John on his direct line at 602-684-0202.